The trio changed some musicians since we started – the concept exists about two years and this current band exists for about a year and a half. 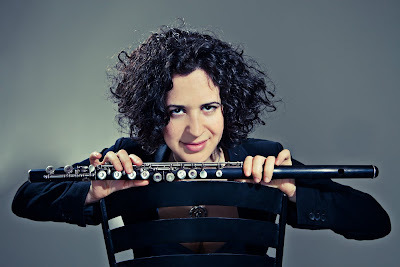 I grew up playing classical music in Israel and was a part of the Israeli Young Philharmonic Orchestra. In New York, I was very active in the Cuban scene and played with bands like Coco Mama (all female Salsa band) Charanga Soleil (Cuban-Haitian-African band where I’m the musical director). I’m also playing with a new cool band called Yemen Blues with Omer Avital, who’s a great musician and a good friend. Lately I’ve been exploring and researching Middle Eastern music and I’m playing with a Moroccan band, Rachid Halihal and Layali El Andalus. Everything. Never had a favorite flutist growing up (even though Pandit Hariprasad Chaurasia is definitely a flute inspiration for me). I listened and was inspired by anything that touched me- from Dexter Gordon to John Coltrane to Fajardo y sus Estrellas to Bjork to Schubert to Oum Kalthoum and Farid El Atrash… You get the picture. Locally I would say Joe’s Pub and Cornelia Street Cafe. Even though I’m sure there are amazing room that I haven’t yet explored. Internationally, I was lately on tour in North US and really enjoyed Triple Door in Seattle and School of Folk in Chicago. MY CD Release Party at Drom on April 13th at 9.30pm with my fabulous trio and some great guests! Come and bring friends! Where can we buy your music? Or even better contact me through my website and I will send one to you! Tell us a story or anecdote about performing live. I always feel excited about playing my music on stage. Sharing such an intimate moment with people you might not know is great. It’s teaching me to let go and to be able to bring what comes in the moment in the most natural way. Can you recommend any other artist we should feature on MurphGuide? Charanga Soleil – A musical ensemble that combines Cuban salsa, Congolese rumba-soukous and Haitian compas. Kath Buckell – A singer/songwriter from Australia. You are celebrating your new CD Journey Back Home. How long did it take to record. Tell us a little about it. Well, the recording process was great. First of all, working with such great musicians as Ziv Ravitz (drums) and Omer Avital (double bass, oud) made the whole thing very easy. We went into the studio to record a demo – it was the first time we played as a trio, except for two rehearsals. We ended up keeping most of that session for the CD, it was just so great! There is magic in keeping the music very fresh before the studio. Then I booked another recording session for the rest of the tunes. Most of the takes are first or second takes. 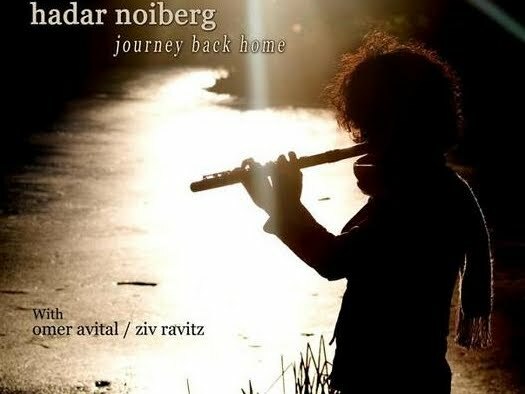 How did you start the Hadar Noiberg Project, Connections? Well, that was how it all began – I was playing a funk gig at a bar and was suddenly thinking about how everything I play or do in life is connected back to me and to one another. That lead me to think about making conscious connections in my music and try and create a new sound. That trio had other musicians and a live at Smalls recording. Now I call the project the Hadar Noiberg Trio. I came to New York at age 21 and very quickly made a name for myself in the different scenes. In the last couple of years I’ve been on a journey to find my roots and the meaning of my music. I’ve been playing so much with people with strong roots and culture such as Argentinians, Cubans, Brazilians etc., and felt like I must dig deeper and see what is the meaning of being Israeli. I chose a bold setting on purpose – flute trio is not something you can hear every day and I must say we really rock. My new CD, Journey Back Home, is also a journey of the flute as a lead instrument. The flute in Western improvised music has always been an instrument that was either used by doublers or was not considered a serious main instrument. In the Eastern and Middle Eastern musical traditions the flute, the Middle Eastern ney or the Indian bansuri are main influential instruments that hold the deep soul of the music. I want to bring that depth and richness into my music which is highly influenced by both West and East, featuring the flute as a strong leading instrument. Well, I’m planning a US tour for my band in October and a European tour in November. I plan to record a third CD, perform in venues and festivals of jazz and world music, have my music played on the radio (already happening in several stations in the US) and make amazing music with my favorite people! Also, I’d like to contribute my musical talent to support important goals such as women’s rights and gay rights. I first learned about you when you wrote to list your upcoming show. How did you hear about MurphGuide.com? I was actually recommended by another website and liked what I saw! Glad we got to know each other.